We're used to dogs enjoying a stroke from their owners but it appears even rhinos appreciate a belly rub from time to time. This South African cameraman is so friendly with the animals he films that pets them at the end of the day. Footage shows Garth de Bruno Austin stroking the female who luckily left his URSA Mini 4K camera alone. He said: 'I have been lucky enough to film this rhino for quite a few years for my rhino poaching documentary 'Disunity' and because of that have built up a level of trust. Warning others against the dangers of petting wild animals, he added: 'Do not try and do this with a truly wild rhino as it may end up with you being killed. 'Once she had enough, she walked away and continued grazing. 'In light of the recent attacks at a rhino orphanage in South Africa, the location of this rhino will remain undisclosed for security purposes. Garth has been filming this particular rhino for a couple of years. Because of this, the animal has gained certain trust towards him although it’s wild. 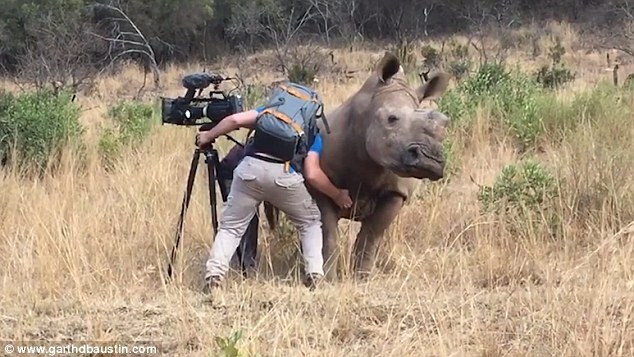 So, the rhino just approached him in the middle of filming asking for affection. 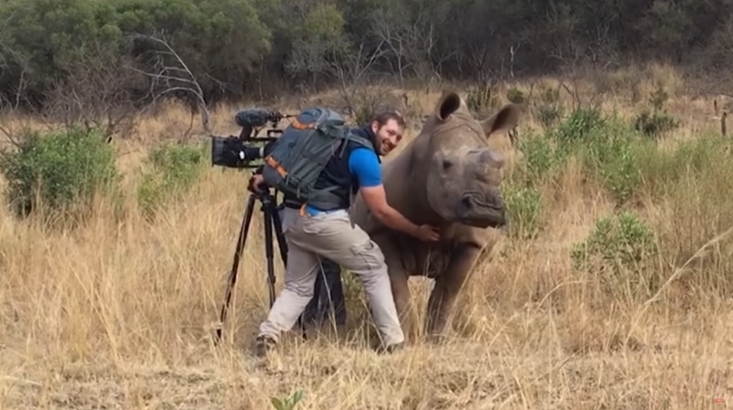 And as Garth writes: “If a rhino walks straight up to you while you’re filming and wants some rubs… you better rub that rhino like your life depends on it!” As a matter of fact, it probably does, since rhinos can be pretty badass if they want. In my opinion, they should be even more aggressive, considering that they are endangered because of poaching. Responses to " Adorable moment an affectionate female Rhino approaches cameraman for a belly rub"
She must have been amongst a lot of good people and has become so used to him being around. She was possibly an orphaned rhino originally and I see she has been dehorned. How wonderful to have that trust for people but scary too as it makes her vulnerable. What is that second person doing ???????? ?